BK27 Single Groove Sheave for Industrial V-Belts. 2.85" OD. Bored to size. Home > Pulleys & Sheaves > Light-Duty Sheaves > One Groove Sheaves - Single Groove Industrial Sheaves > BK26: Light Duty Sheave. Solid Type. Bored to size. > BK28: Light Duty Sheave. Single Groove. BK-28 Pulley Bored to size. > BK25 Light Duty Sheave. Single Groove. BK-25 Pulley Bored to size. > BK23 Light Duty Sheave. Single Groove. BK-23 Pulley Bored to size. > BK24 Light Duty Sheave. Single Groove. 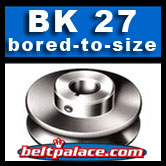 BK-24 Pulley Bored to size. > BK27: Light Duty Sheave. Single Groove Sheave BK-27. Choose bore. BK27 Single Groove Sheave for Industrial V-Belts. 2.85" OD. Pitch Diameter for 4L = 2.10". Pitch Dia. 5L = 2.5". Precision machined grooves.